Family Crest Rings for men are a true and treasured family heirloom. These particular rings are the ultimate display of family pride. A unique way to commemorate and honor your ancestors from centuries past. Maybe one of your ancestors was a great medieval knight who wore the family crest ring with your family’s emblems engraved on the face of it. Whether you purchase Silver or Gold the engraving will be exactly the same. 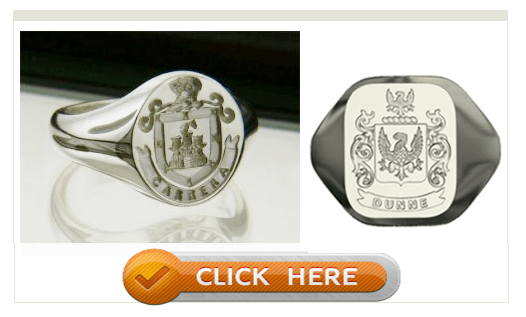 The details on the rings are taken from the Coat of Arms which relates to the original family. In some cases this will date back to the tenth and twelfth century. It is also worth pointing out that some Coat of Arms in Europe were totally destroyed during the great fires. In some cases those that were destroyed, a new Coat of Arms is believed to have been created to replace the original. If you contact the College of Arms they will shed further light on this aspect of heraldry. This ring was the first ever signature ring. It certainly is a lovely ring with a practical element to it. The face of the ring will have the markings taken from your Coat of Arms. These markings include the shield area and the crest. Markings will be engraved on the ring surrounded by the mantle. Directly beneath these engravings the family name will be engraved on a special heraldic ribbon. Family seal rings are very similar to the family crest rings and are available in Silver and Gold. To create the seal you simply get sealing wax which and press the ring on it. Wax is available in various colours, but the most popular colour and the one that we are most familiar with is crimson red. Place a few drops of wax on the letter or the envelope wait a few seconds until the wax is beginning to set then press the ring into the wax. Then wait for a few moments and remove it. You should now have a perfect seal displaying your Coat of Arms which was widely used in former times. It is believed the old saying “let’s seal the deal” came from carrying out this deed. With Gold continuously rising now is the time to purchase. They are available in Yellow and White Gold. Starting at 9k Gold right up to 18K gold. Remember the higher the carat the softer the Gold. Those who are considering purchasing a ring, often pose the following question. Should I buy 9K or 14K? I answer this by first asking them as to what type of work they do and do they want to wear the ring all the time. Is it for occasional wear or for everyday use. If you work manually and would like to wear the ring all the time I would suggest a 9 or 10K Gold Ring. This is because the the metal is hard and won’t mark as easily. If on the other hand you want to wear the ring occasionally there is nothing as beautiful as a 14k Gold Ring. We currently have rings for Irish names, Spanish names, English names and other European names. Before we make any ring we will send you a copy of the family Coat of Arms that we will be using. All you have to do is approve it and you will have your ring in about three weeks.